ENCINITAS — Last week, residents once again railed against proposed “density bonus” housing projects during a council meeting. California’s density bonus law gives developers permission to build extra homes on parcels if one or more of the units is reserved for low-income residents. Critics say the projects defy community aesthetics and create safety hazards. They also argue the city isn’t doing enough to fight density bonus. “This is going to be a reoccurring issue the city can’t ignore,” resident Ron Ranson said on Monday. 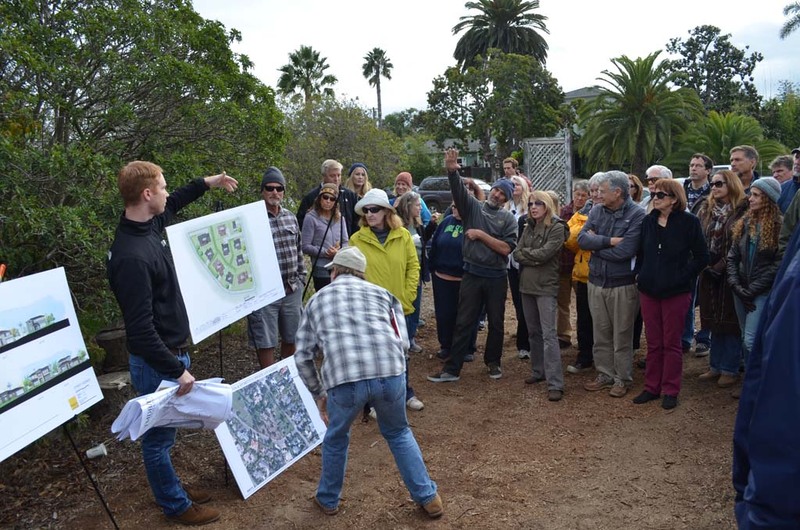 He added the projects are becoming more common in Encinitas, likely because land is becoming increasingly scarce and developers want to maximize profits. The City Council recently sent a letter to the League of California Cities in hopes of gaining more local control over the projects. But at this point, council members maintain there’s not a whole lot they can do considering density bonus is a state law that trumps local zoning. Residents are especially concerned about a proposed density bonus project on Fulvia Street. In that case, the law permits a total of 10 units on a 2.16-acre parcel in return for constructing one-low income unit. Normally, city zoning would only allow six homes there. California passed the density bonus law in 1979 with the aim of bolstering affordable housing stock throughout the state. For years, there was a 25 percent cap on additional units granted for a density bonus project, Planning Director Jeff Murphy said. But that limit was raised to 35 percent in 2005, making the law more attractive to developers. Those against the projects have also argued the city incorrectly calculates density bonus projects, falsely driving up the number of units. Specifically, they take issue with the city rounding up housing unit fractions. To understand the concern, consider how six homes became 10 on Fulvia Street. City zoning permits a maximum of 6.45 units on the site. Due to density bonus, that’s rounded up to seven. Then, factoring in a 35 percent density bonus increase equals 9.45 units. This number is again rounded up, bringing the total to 10. Cities like Los Angeles round down the first part of the calculation, resulting in fewer housing units, resident Gerald Sodomka said at last week’s council meeting. Encinitas used to round down “base density” fractions as well. However, the city began rounding up after it was sued in 2008 by a developer for not following the density bonus law, Murphy said. Carlsbad, for instance, also rounds up, according to its municipal code. Cities should be able to round down density bonus calculations for fractions less than .5, Mayor Teresa Barth wrote in a recent letter to the League of California Cities. The organization advocates for changes at the state level on behalf of local governments. And Barth’s letter has other recommendations for revamping the law. For one, it states the city should have the authority to determine whether a density bonus project is appropriate for a community. Also, it says the criteria for evaluating density bonus projects should include a project’s proximity to public transit and additional measures. “In Encinitas, we have had density bonus projects proposed in areas that do not provide easy access to public transportation, services or job opportunities,” the letter states. The letter suggests yet another yardstick: does the project actually have a net increase on affordable housing? At last week’s council meeting, Barth said League of California Cities representatives have taken an interest in Encinitas’ position on density bonus. For now, though, it’s not a priority. There are currently four density bonus proposals in Encinitas, according to a log of planning applications. The number of approved density bonus projects over the past five years was not available by press time. The 16-home Desert Rose development in Olivenhain ranks as the most controversial. In the face of heavy opposition, the council approved it last year, arguing its hands were tied by California law. In turn, residents filed a lawsuit, saying that cramming so many homes on the site would result in increased traffic and safety hazards. The case will be heard later this month. In Carlsbad, a city with nearly double Encinitas’ population, developers haven’t built any density bonus projects over the past five years, according to Debbie Fountain, the city’s director of Housing and Neighborhood Services. Fountain said developers haven’t chosen that option in Carlsbad because the city has a flexible permit system. Essentially, on a case-by-case basis, the city grants density increases to developments that promise to set aside some low-income units. In Encinitas, however, it appears the density bonus issue isn’t going away anytime soon.